Eminimethods.com - emini trading systems, emini day trading course, unique trading methods, free education for emini futures traders. This site, eminimethods.com, dedicated primarily to trading e-mini futures, has two major purposes: educational and commercial. The former of these purposes is more or less obvious and you may understand it as my service to the trading community in the form of advice. You can take it or you can leave it ... It's up to you, but if you are new to trading, and especially new to e-mini day trading, I am convinced that learning from my experience will save you thousands of dollars and tons of frustration. That's because e-mini trading, while highly lucrative to those who have mastered it well, can be a pretty risky business to all those who have approached it unprepared. I offer here some of e-mini trading systems, methods or strategies I have designed for trading stock index futures known as e-minis. E-minis, or e-mini futures, are electronically traded smaller units of older futures contracts such as S&P 500 or NASDAQ 100 that have been around for decades. These systems are intended for e-mini day trading, so they never hold position overnight, but they do not necessarily trade every day. Being volatility driven systems, they engage in trading only under right circumstances. They are rule based, totally objective systems, so their results are much easier to emulate than is the case with discretionary trading strategies. 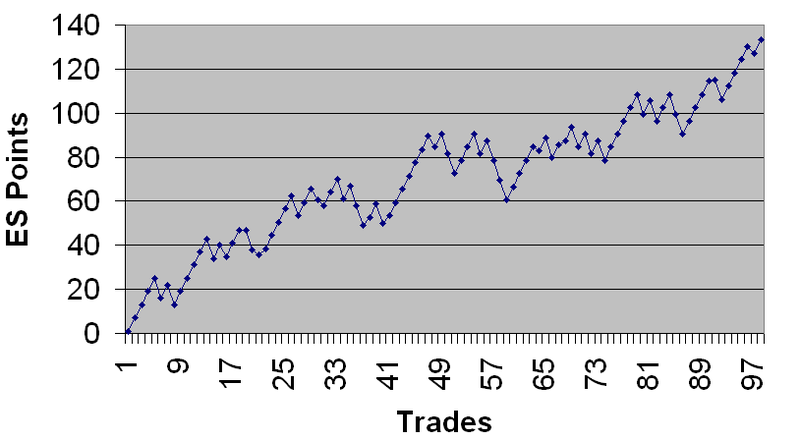 An equity curve of one of such systems is shown here. This system most recent performance is reported on this page. The e-mini trading systems I sell are fully disclosed, so that you can also learn how to build such systems. This information, however, is meant to be confidential and for a personal use only. Not to mention that keeping it that way is also in the best interest of those who have acquired access to it. 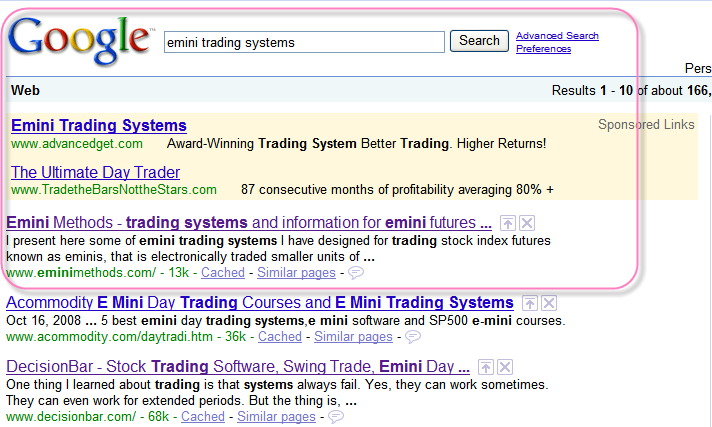 You will also find here a very popular e-mini day trading course. Its name, KING, seems rather fitting in that the trading methodology (collection of trading methods and ideas) the course is based on boasts of quite spectacular trading results among its students whose ranks keep growing every month. While this course was originally developed for the Dow Jones e-mini futures, it can also be successfully used for trading other emini markets, including the very popular S&P 500 e-mini futures. I would never call KING a trading system, as I choose to reserve this name for purely mechanical trading systems. KING is an e-mini trading course that is based on unique discretionary ideas and strategies, which can be more robust and thus more suitable for trading, especially for those of modest means, than most mechanical systems. The KING e-mini trading methodology comes with an uparalleled amount of evidence that its ideas are sound which includes a good deal of my own trading results. If you would like to have a look at them, you can do it in extensive trading results sections that span many years. 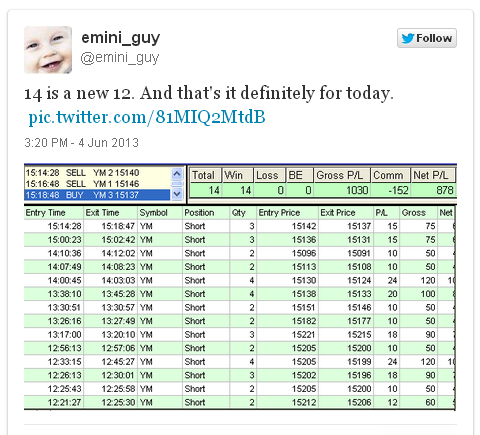 That alone should, I believe, give you a pretty good idea if my e-mini day trading ideas are any good. By the way, I don't think you will be offered this type of glimpse on too many web sites out there. Don't ask me why ... I also don't understand why the day trading results have to be poor to be "true." If you believe that too, look elsewhere. At times, I may also be tweeting my trading results in near real-time. Yes, they can be that good. Or even this good. KING is now the main e-mini trading product offered on this site. The e-mini futures trading instruments have been around only since late 90s, so they are still relatively new, although their volumes have already reached sizes that make trading them fairly comfortable and their popularity is growing with more and more people joining the ranks of part-time or even full-time e-mini traders. However, for those totally new to day trading e-mini futures, there is a special large section on this site dedicated to e-mini day trading. It contains several sub-sections that cover the most important things the beginner to trading these markets needs to be familiar with, such as e-mini futures trading basics, and provide other basic educational resources. Additional information can be found in an A Word of Advice section of this site, dedicated primarily to trading e-mini futures, but also to the trading business in general or to trading stocks. 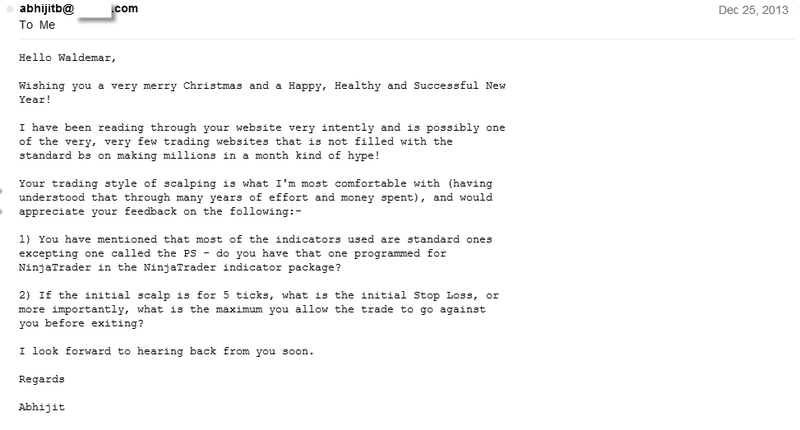 This site is also a home to my original method of trading stocks that I used successfully for several years. While most stock trading ideas rely heavily on technical analysis and thus are unlikely to offer new trading perspectives, this method, Easy Money in Stocks (or EMIS), goes beyond that. There is also a small section of e-books here with some ideas on trading stocks written by others, which you may consider too. If you are interested in e-mini trading systems, discretionary trading methods offered as a futures day trading course, stock trading ideas, or trading in general, you have certainly come to the right place. All education, even information others choose to keep secret, let alone the very e-mini trading basics, is offered totally free. 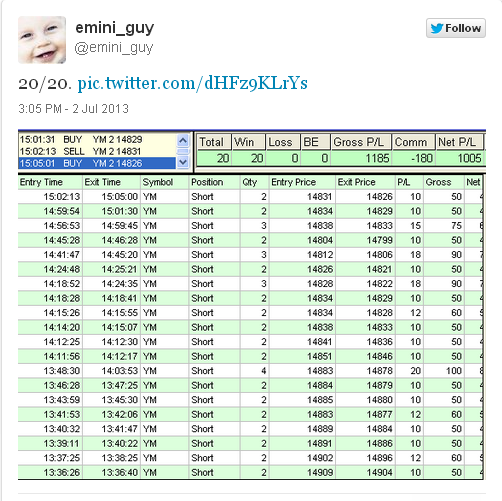 The trading systems or methods, including the popular e-mini trading course, while not free, are pretty affordable. In one word, you have arrived at a premier site dedicated to all things e-mini futures and even more. As confirmed by Google, and on more than one occasion.